How to crack WEP with Intel PRO/Wireless 3945ABG is a task that can employ you for a long time. The Intel PRO/Wireless 3945ABG network adapter driver that comes from the manufacturer does not provide packet injection and network monitoring capabilities which are needed to crack WEP, and therefore before you attempt WEP cracking efforts, you have to update your driver first which can be a daunting task. First, let's explain some background to WEP cracking. WEP is short for Wired Equivalent Privacy or Wireless Encryption Protocol, and it is one of the measures in wireless security that were at the inception of wireless networking. WEP has been flawed since its inception, but because nothing better was available in the beginning of the Wi-Fi era, it was publicly implemented as "better to have flawed WEP than nothing at all." Because WEP includes many shortcomings, many enthusiasts out there enjoy simply going through the effort of attempting to "break it" or to "crack it". Cracking the WEP in this context means simply obtaining the WEP key to gain access to a wireless network access point and to the network. You can read more about WEP in general in our Wireless Wi-Fi network security tutorial 101 (part 1). Second, we have to talk about the legality of WEP cracking. Some people do it for fun, some do it to learn, some do it as a proof of concept, some do it to test their network vulnerability, some do it "just because", some do it for other reasons. Breaking someone's WEP key for the purpose of gaining access to someone else's Internet access or data is not ethical, and we can't assume any implied or expressed responsibility for your actions. This web page is provided for educational purposes only, and only to those visitors who wish to learn WEP cracking for legitimate reasons (such as testing their network). We provide this tutorial which talks about How to crack WEP with Intel PRO/Wireless 3945ABG. To be fair, we also would like to draw your attention to our five-part wireless security tutorial which helps you to make your network more secure. Our tutorial talks about WPA, WPA2, MAC addressing, IPSec, VPN, PSK, and many other wireless security measures. It depends on your initial knowledge and equipment. Cracking WEP itself is relatively easy and can take as little as 5 minutes. The problem is often with setting up your computer, so that it does what it needs to do for WEP cracking. 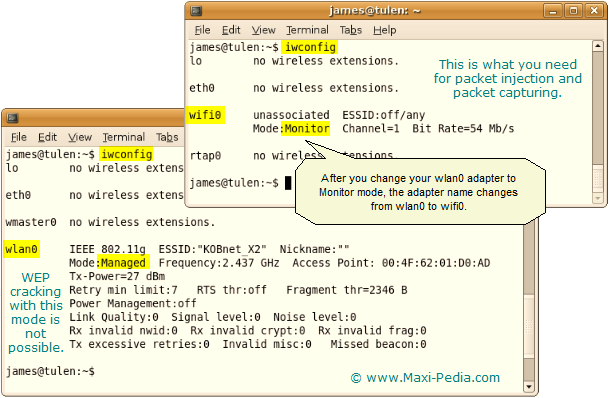 In most cases, you need to upgrade your wireless driver which you first need to find somewhere. Finding out how to set up your computer to crack WEP can take weeks! The Intel PRO/Wireless 3945ABG network adapter is a relatively new network interface that is being put into currently manufactured laptops, especially ThinkPads. The driver that comes with the adapter from Intel does not support adapter promiscuous (monitor) mode and packet injecting and needs to be updated. Crack WEP with Windows XP, Windows Vista, or Linux? There are many tools and approaches available on the web for WEP cracking, and one can get easily lost and confused when reading all the information provided on discussion forums (OmniPeek, WinAirCrack, airmon, aircrack, Kismet, mac driver, ipwraw driver, ilw3945, etc.). The first question that needs to be answered is which platform to use. Some have had success with Windows XP. We have not seen anyone having success WEP cracking with Windows Vista. 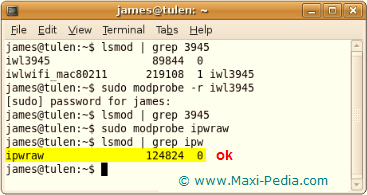 It is advised to attempt WEP cracking with Linux (we used UBUNTU). This is for one major reason. Since Linux is open source, it is much easier to find or develop Wi-Fi drivers for your Intel PRO/Wireless 3945ABG network adapter to get access the needed functionalities. Are you new to Linux? Do not worry. Downloading UBUNTU image, burning it to DVD and installing it as a dual boot to your computer is very simple and takes no more than a few hours. Just follow prompts in the Ubuntu installation process. After installing Ubuntu, get all system updates in the system application manager. Which Intel PRO/Wireless 3945ABG interface driver to use to crack WEP? Packet injection is a computer networking term which refers to sending a packet on a network into an already established connection. Monitor mode, or RFMON mode, allows a computer with a wireless network interface card (NIC) to monitor all traffic received from the wireless network. Monitor mode allows packets to be captured without having to associate with an access point or ad-hoc network first. When searching web, you can find information about endless number of drivers for the Intel PRO/Wireless 3945ABG adapter, such as mac80211, IEEE80211, ipwraw, iwl3945, ipw3945, iwlwifi, madwifi, serialmonkey driver, driver from tinyshell.be, wildpacket driver, and many others. Installing and/or patching them may not be very easy. We have had good luck with the ipwraw driver from aircrack. The lines of code below install the driver (together with other two packages) to your Ubuntu installation. then it means you are not using ipwraw. Check your loaded modules with the lsmod command. If you see something like iwl3945 or mac802 on the list, then you are not using the patched driver. Important: Once your driver is set to Monitor mode, you will not be able to browse the web in your internet browser until the adapter is set back to the Managed mode. The next step is to pick the program that does the job of WEP crack. Which program to use to crack WEP? This command executed in the terminal window will get aircrack and install it. Once we have our computer ready for WEP cracking, we can proceed to the fun part which is described on the next page: How to crack WEP encryption (wifi security).